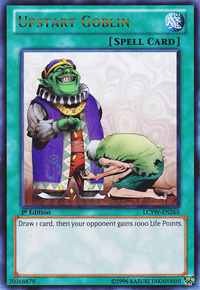 Draw 1 card, then your opponent gains 1000 Life Points. 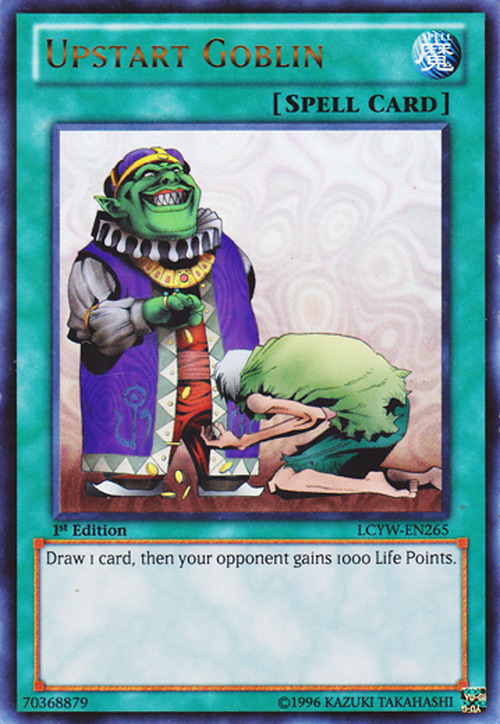 This card's artwork is an ironic role reversal of Second Coin Toss, in which a human is dropping coins for Goblin of Greed to pick up. Mystical Refpanel: You cannot Chain "Mystical Refpanel" to cards like "Card Destruction" or "Upstart Goblin" that target multiple players. You cannot use it against Equip, Continuous, or Field Spells. Nature's Reflection: If "Nature's Reflection" and "Bad Reaction to Simochi" are in effect and your opponent activates "Upstart Goblin," they will take 1000 damage.